Book Tibet Tour: Qinghai -Tibet Plateau Overland Expedition?and visit Lhasa and Xining! Hightlights: Qinghai Lake,Taersi Monastery,Sun and Moon Mountain,Yambajan hot spring,Potala Palace,Jokhang Temple,Barkhor Street. Met and transferred to your hotel for a short break. Pay a visit to Taersi Monastery. Taersi Monastery is named from the Great Temple of Golden Tile, one dedicated to Zongkaba. 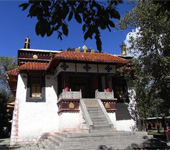 The temple is actually comprised of several temples, halls for scripture, Buddhist pagodas and monks' dormitory, and incorporates both Tibetan and Han architectural styles. Accommodation: Xining Hotel or similar. Accommodation: Chaka Hotel or similar. After breakfast, take a bus ride to Golumd, see Gobi sight, oasis in the desert, and so called Treasure bowl, also one of the four basins in China Qaidam basin on the way, arrive in the pearl of Gobi Golumd at night. Accommodation: Golumd Hotel or similar. After breakfast, begins our tour to the mouth of Mt Kunlun along the highest altitude road in the world. (The mountain has a steep terrain, a unique ecological environment and a magnificent natural scene. Here you can also see numerous hills rising one upon another, snowy peaks towering into the sky, and a vast expanse of grassland. It is also renowned as the ancestor of all mountains and the backbone of Chinese nation. The rift zone caused by the 8.2 level earthquake happened in 2001 is also accessible.). You will pay a visit to magic spring of Kunlun, jade pearl peak, statue forest, mouth of Kunlun Mount, overlooking Kekexili. ( Appreciating its graceful and elegant beauty, you can be enchanted by scenes like snow mount, plateau, grassland and lake. ). Accompanying by afterglow of the setting sun, you are expected to cross the first bridge on the Yangtze river. ( The river, quite wide, is not only the source of Yangtze River, but also the Yellow river and Lancang river. Since it is the main source of the three world-famous rivers, Qinghai province gains the reputation as Asia water tower. Accommodation: Tuotuo Hotel or similar. After breakfast, you will be transferred to Yanshiping stop and never-froze spring, crossing the mouth of Mt Tanggula (The dividing ridge of Qinghai and Tibet, it proves itself as the mount in the plateau with icy peaks and snow ridges surrounded ). You can take a look into the distant source of the Yangtze River (Jianggendiru glacier, on the southwest of Geladandoong Icy peak, the main peak of Tanggula Mount. The ice tower forest here has thousands of shapes, just like a slim and graceful lady standing in Crystal Palace, overshadowing grand buildings far away. The melting water from glacier flows down merrily, thereby making it the source of the first river of the Yangtze river (Tuotuo river), and Geladandong Snow mount (With a height of 6621meters,it is the source of the Yangtze river; The dazzling and various postures icy tower forest is undoubtedly the ice engraving built by the nature in thousand years, which is the art work of the creator and has no equal in the world). Accommodation: Damxung Hotel or similar. After breakfast, you will go to the roof of the world feeling magnificent view in the third pole of the world and changeable plateau climate, also the natural Namtso Lake located between Damxung and Baingoin counties. (As the highest altitude holy lake in the world, it oversees the lakeside, where blue water and sky blend into one harmonious whole. Islands in Namtso scatter all over like stars in the sky. Odd-shaped rocks in Zhaxi Island, southern lake, and caves with numerous legends combine to make many unique types of scenery. Then you will be transferred to Yambajan hot spring. Incessant Tanggula snow mount, boundless stretch of north Tibet grassland, colorful flags waving in the air, graceful Namtso are elements that make the breathtaking view. On the way you can also overlook the main peak of Tanggula mount, which has an altitude of 7717 meters, cross the mouth of Nagenla mount, 5190 meters altitude. In addition, enjoy yourself in hot spring of Yambajan. ( Fyi, outdoor hot spring fee is RMB40/person or RMB60/person inside. Please bring your own swimsuit since its quite expensive buying there. 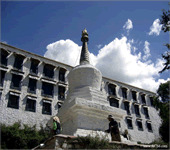 ), along the Lhasa river comes the sunlight city Lhasa. After breakfast, you are on the way to the pearl of world roof-Potala Palace. Also you will visit the Jokhang Temple, posing as an absolute power in Tibetan Buddhism. Then you are free to wander around the oldest street-- Barkhor Street. After breakfast at your hotel, the perfect Qinghai-Tibet bus tour ends.